Suitable for high pressure systems and combi boilers (1 bar). Individual control for temp and flow. Quality brass body. Centres 150mm +/- 5mm for easy fitting. 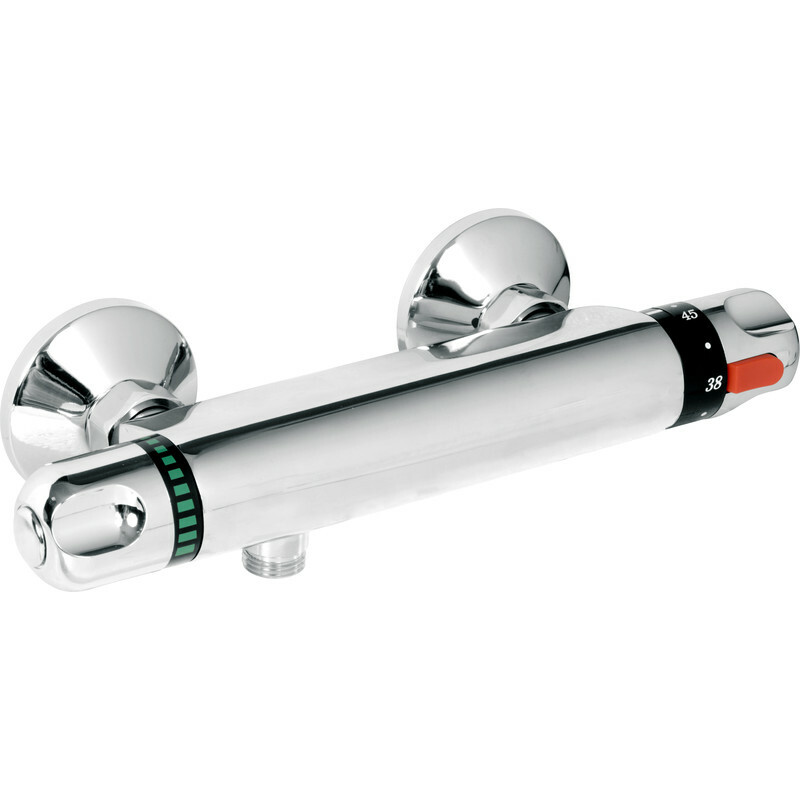 Modern Thermostatic Bar Mixer Shower Valve 280mm Long is rated 4.6 out of 5 by 28. Rated 4 out of 5 by sbelectrics from Good Value Works well, looks attractive and fitted quite easily, but does require a pair of wall-mounted 1/2" BSP female fittings mounted flush with the wall, which some of the more expensive valves eliminate with a 'compression' mounting kit. The body is solid chrome-plated brass, but the knobs appear to be plated plastic, so how long they will retain their appearance is uncertain. Rated 5 out of 5 by Dick40 from Great shower bar I bougth this to replace old one comes with in built filters and rubber washer work fine. Its simple to fit if you have 150mm centres and works well , easy operation of on off control and responds well to temperature change. Cant comment on reliabilty as just been fitted. Rated 5 out of 5 by Graham1340 from Good item Easy to fit. Good pressure and temperature mixing. Rated 5 out of 5 by Frank of gosport from Thermo Shower vv Seems perfect.half the price of the previous one.easy fit. Rated 5 out of 5 by 2suits from Simple and easy Simple easy to use and install. Rated 5 out of 5 by Beaufighter from Quality product. Bought to replace a worn out unit in one of my rental properties. So easy to fit it really could not have been simpler. Although the centres measured up to 150 mm, this comes complete with a couple of offset fittings should centres be a little off of this. Heavy chrome finish and clear numbering with set button for safe temperature. I would have no hesitation in purchasing another. Amazing price and free delivery too. Rated 5 out of 5 by wormhole from great quality.. this was very easy to fit, worked great, very good value for money.